The first time you register for baby gear, you know you’re gonna need some of the basics like a car seat, stroller, onesies, and swaddle blankets. But what about the other thousands of products out there? Most of them you probably won’t need (we’re looking at you PeePee Teepees), but there are some that might make your day-to-day life with baby a little easier and those might be worth the purchase. We’ve compiled fifteen of our favorites below. Don’t be a rookie mom, make grocery shopping with your baby a whole lot easier by getting yourself a Binxy Baby Shopping Cart Hammock! The Binxy Baby clips onto most shopping carts leaving you plenty of room for groceries below. Even better, if your baby falls asleep on the way to the grocery store and you don’t want to take them out of their car seat, you can also use the Binxy Baby to securely hold their car seat in the shopping cart. Then when you’re done shopping, simply roll it up and put it back in your diaper bag. Pretty smart, huh? The Binxy Baby can be used from birth until your kiddo can sit unassisted, and then they’re ready to transition to the big kid shopping cart seat! BUY IT HERE. The BabyBum Diaper Cream Brush is made of soft flexible silicone and allows you to apply diaper rash cream to your baby’s bum faster, thicker, and smoother than when using your fingers and you’ll be left with clean hands! It’s a no-brainer, right? There’s a reason this product has over 90% five-star reviews on Amazon! BUY IT HERE. It can be challenging to administer medicine to a baby, and really stressful when giving antibiotics (or another medication) where you really need accurate dosing. 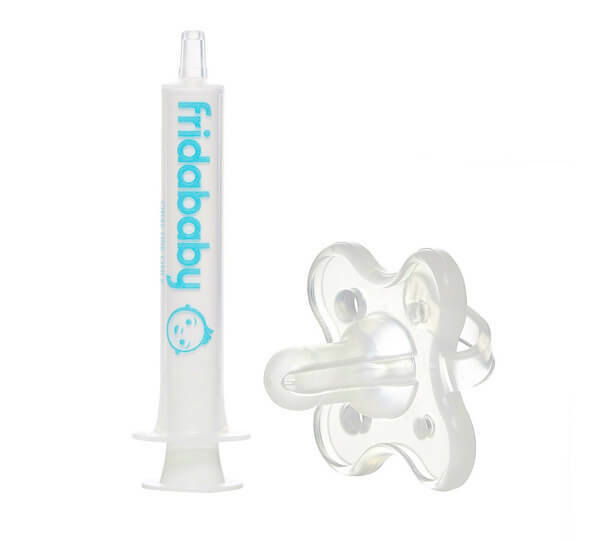 The FridaBaby Accu-Dose Pacifier Medicine Dispenser helps solve that problem. It delivers a dose of medicine through a pacifier, sending the medicine to the side of the cheek and bypassing their taste buds to (hopefully) prevent them from spitting it back out. You’ll know your baby got the full dose and there’ll be no mess to clean up! BUY IT HERE. Why is clipping a baby’s nails as frightening as childbirth? Okay, it’s not that bad, but it’s close! Don’t mess around with traditional clippers on those tiny delicate fingers – do yourself a favor and buy this baby nail file instead. Made from a genuine Czech glass, the Baby Blue Giraffe nail file very gently trims your newborn’s delicate nails and allows for more control so you’re not accidentally clipping any skin (ending in tears for everyone). BUY IT HERE. 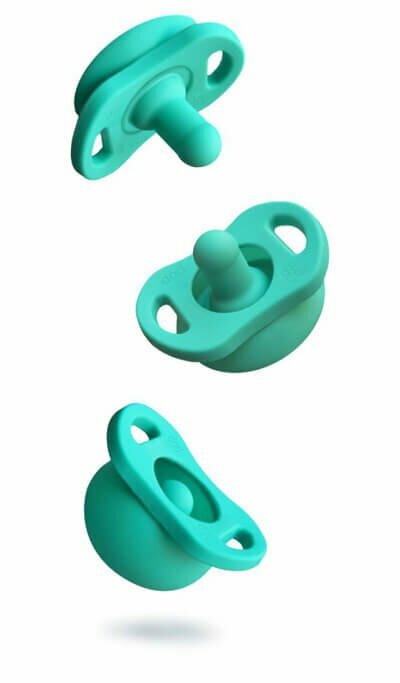 The POP is the only pacifier that stays clean by popping back into itself when it’s released. No need for a case! The POP comes in really cute colors like “In Teal Life” and “Make Me Blush” and is recommended for babies 0 – 6 months old. BUY IT HERE. Do you have a tall baby who seems to outgrow their bodysuits before they’ve even worn them much? The Snappy Sprout Bodysuit Extender is here to save the day (and you lots of money)! Made of 100% cotton flannel, this brilliant product extends the life of bodysuits by allowing your baby to wear them longer. They are also great for those adorable cloth diaper bubble butts that need some extra booty room in bodysuits. 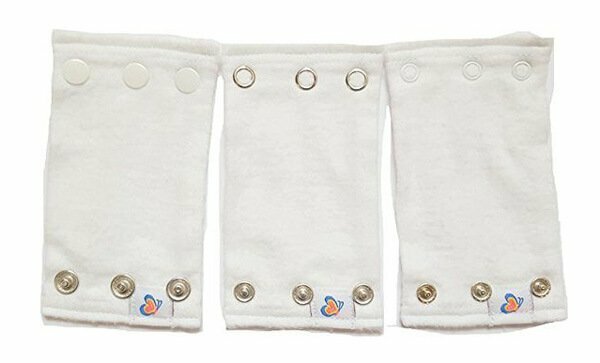 Baby clothing manufacturers use different size snaps on bodysuits, but fear not, the Snappy Sprout comes with 3 different snap sizes to fit most brands. BUY IT HERE. 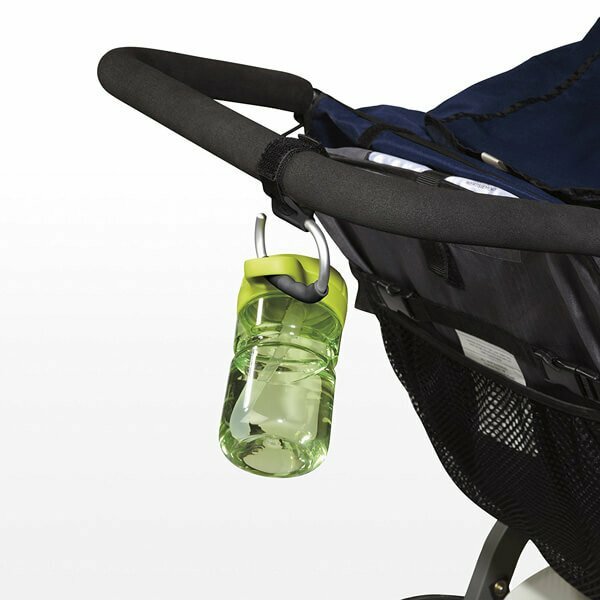 For that extra set of hands all parents need, the OXO Tot Handy Stroller Hook is a stroller essential. Made out of strong aluminum, the hook can be attached to your stroller handles or frame, fitting all stroller makes and models. It is perfect for grocery shopping, clothing shopping, or hitting up the farmer’s market – just hang your shopping bags on the hooks instead of trying to stuff your bags in the basket below or carrying them yourself (insider tip: get two hooks so you can distribute the weight better!). You can also use the hook as a convenient handle for your older child to hold on to as they walk alongside the stroller. We promise once you have one you won’t know how you survived before! BUY IT HERE. For those babies who are eager to sit up and see the world from an early age, the Kidco Huggapod Infant Seat Cushion is the perfect solution. It provides extra comfort and support in exercisers, jumpers, highchairs, park swings…you name it. It features a pillow cushion for extra head support, secure fastening straps, and an adjustable design to grow with baby. 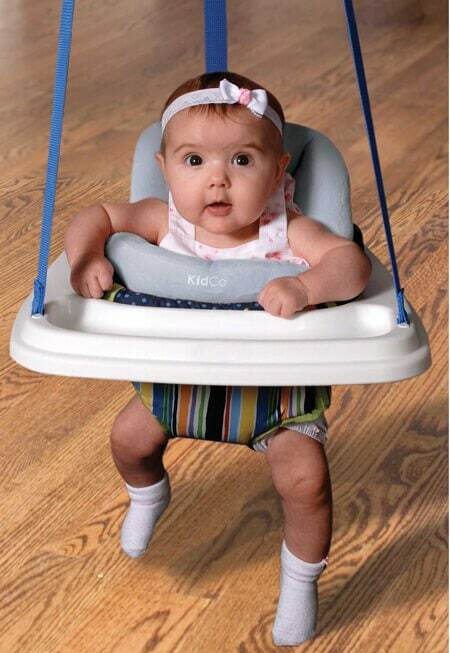 It adjusts to fit infants to toddlers and is especially great for special needs kids with low muscle tone. BUY IT HERE. 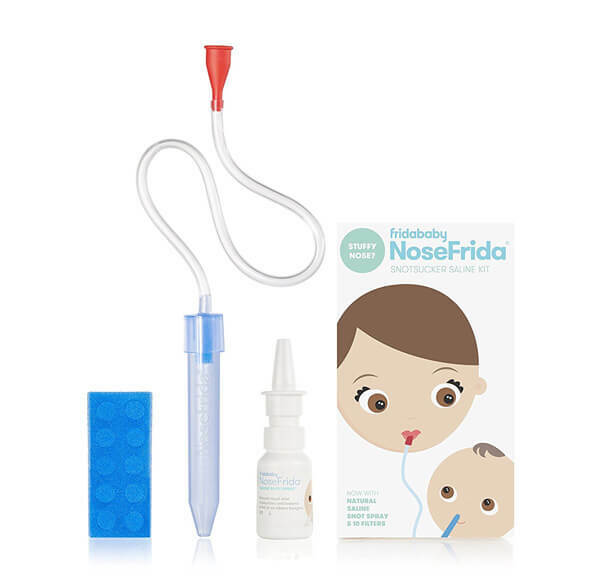 When it comes to babies with stuffy noses, the FridaBaby NoseFrida Snot Sucker is the superhero coming to save the day. As the name indicates, it is a nasal aspirator that uses parents’ own suction to safely and effectively clear stuffy noses. It is dishwasher safe and more hygienic than traditional nasal aspirators due to disposable filters that are proven to prevent any bacterial transfer. This one has been a parent favorite and once you get over the “Ewwww” factor we know it’ll be a parent favorite. BUY IT HERE. Picking up a wet, tiny, squirming infant from the bathtub and wrapping them in a towel feels like it requires at least four hands…until now. Meet the Puj Hug Infant Towel. It allows you to comfortably and securely wrap your baby in their towel after bathtime! The Hug has two silicone tabs that interlock securely around your neck, allowing you to pick up the baby with two free hands. Just place baby on your chest face down, unlatch the hooded side of the towel and wrap around baby, keeping your baby completely covered and safely in your arms. With the Puj Hug, you’ll be handling bath time like an old parenting pro. BUY IT HERE. Designed by an Occupational Therapist with arthritis, the UnbuckleMe Car Seat Buckle Release Aid makes it much easier to get your child out of the car seat by reducing the force required to unbuckle the car seat by more than 50%. It’s a great option for parents or grandparents who have arthritis or other pain in their fingers, or older children who want to independently unbuckle themselves but don’t yet have the strength. The UnBuckleme has a small loop so it can be attached to a keychain or diaper bag, making it easy to keep nearby. BUY IT HERE. We’ve all wrestled with uncooperative crib mattresses when you’re simply trying to change the sheet, and it’s even worse when your baby is sick in the middle of the night. 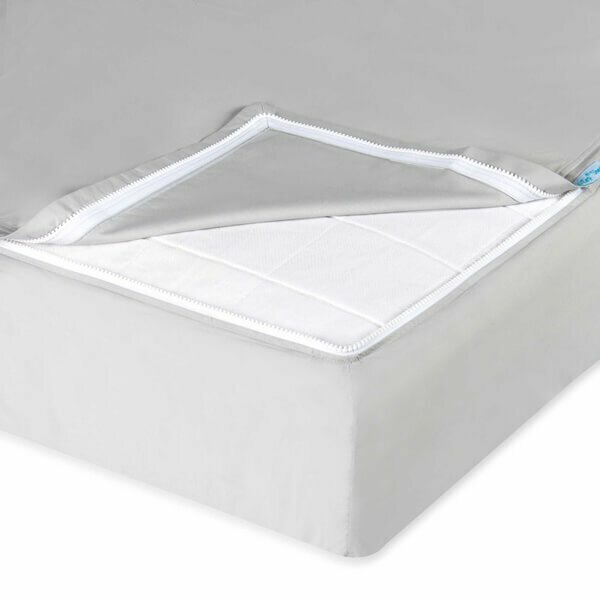 The QuickZip Crib Sheet allows you to change the crib sheet without breaking a sweat – just zip the dirty sheet off, zip on a clean one, and you’re all done! Easy peasy! BUY IT HERE. Changing diapers on the go is about to get a whole lot easier! 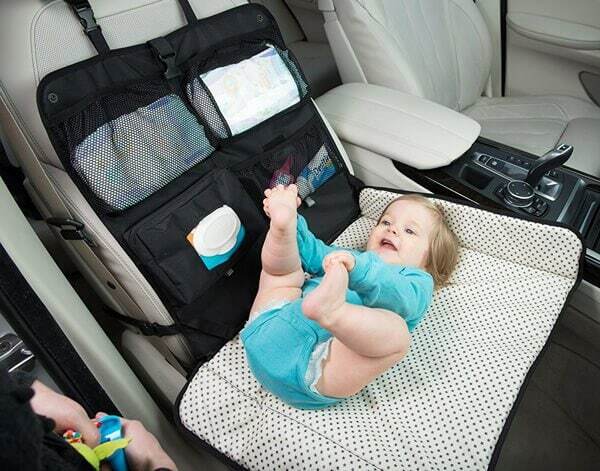 The Beanko Mobile Changing Station is a backseat organizer and mobile changing station that attaches to the vehicle seat and quickly folds down when you need to change your baby’s diaper on the go. The unique foldable wedge keeps babies from rolling on angled car seats, making changing diapers in the comfort of your own car as easy as can be. This one’s a great solution for families that are constantly on the go or taking long road trips. BUY IT HERE. 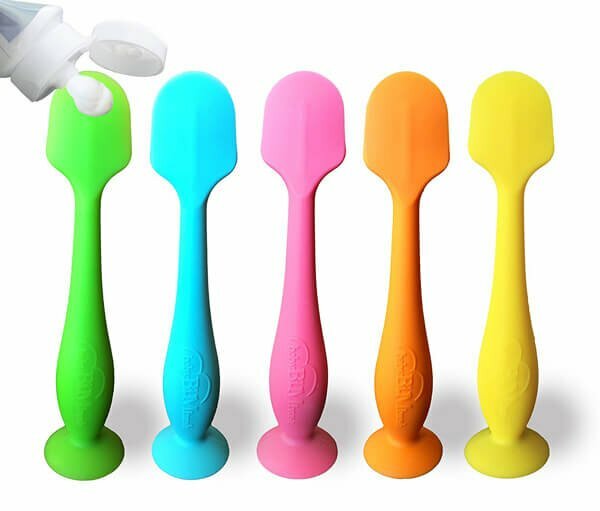 The Boon Squirt baby food dispensing spoon is a great solution for on-the-go meals. This convenient one-handed feeding spoon dispenses baby food one bite at a time! It holds up to 3oz (an entire jar of baby food!) and includes a cap for storage. Feeding your baby is about to become much less messy! BUY IT HERE. We all know how miserable it can be when your baby gets a stuffy nose and you’re desperately trying to clean it out. Oogiebear to the rescue! Oogiebear is a gentler, safer, cleaner, and more effective way to clean out your baby’s nose (or ears). It’s made from a soft rubber, and the bear head design isn’t just cute, it prevents Oogie bear from going too far into your baby’s nose. BUY IT HERE. I love products that simplify my life haha. The oogie bear, nose frida and diaper rash cream brush have all been lifesavers for us!